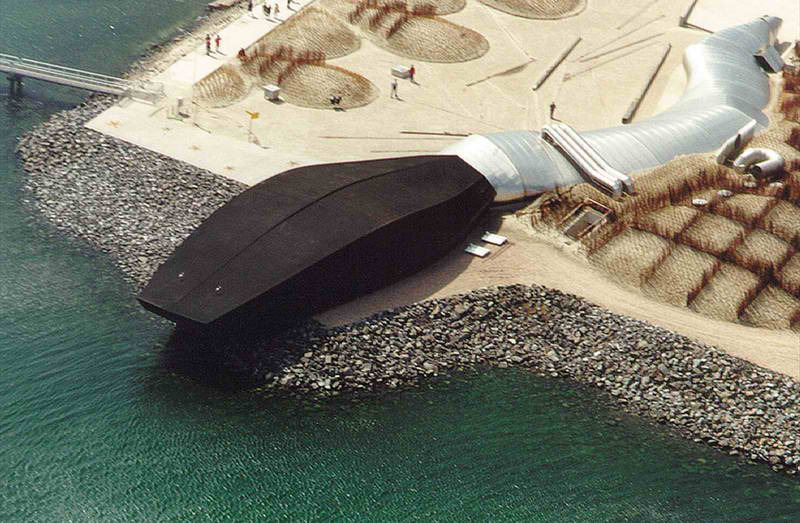 Buildings are generally thought of being static structures playing a dual role in hosting and defining spatial context. The different types of buildings are adjusted to different activities and usages serving as platforms for interaction and communication. A building live span is usually beyond the human live span and types are developed over generations of buildings adapting to chaining conditions such as context usage or activity, but also material and performance. The context has a very strong influence. Historically even more so as the direct surrounding and conditions shaped the resulting building directly via ground conditions, available materials near by and climate conditions. Along these parameters local and very specific building cultures have developed. And all of them are tightly entangled with everyday culture and practice and form a very important part there of. Todays conditions have changed, with possibilites to source materials from around the globe and buildings being developed for less specific usages but the connections and context relevance are still very similar. Even if architects planners and especially developers are trying to denying any of this with some of the building they put up, building are still placed in context with adjoining developments. In his new book ‘Towards a New Kind of Building – A Designer’s Guide for Nonstandard Architecture’,published by NAi Publishers in 2011, the Dutch architect Kas Oosterhuis discusses the paradigm shift in architecture thorough the aspects of shifting design, production and manufacturing processes, highlighting the changes. He uses his own architectural work both with his office ONL and with the Hyperbody research group at the University of Delft as a reference and discusses these shifts in a wider social context. The book is structured along the process Oosterhuis is proposing with ‘Tag – all components will be tagged as to process information’, ‘Shape – the point cloud is organized by power lines to shape the body’, ‘Move – building components are actors in a complex adaptive system’, Evolve – the building body is a personal universe living inside evolution’. The talking is of parametric design. Using the digital design tools the design process has shifted from individual blocks and pieces to mesh surfaces, continuous and flexibel materials strapped over point clouds and adaptive algorithms. Oosterhuis is also putting lot of emphasis on the changes and shifts leading from a top down to a bottom up planning process. He proposes this as a result of the shifting processes. What he puts forward he summarises with “From mass production to mass customisation”. The book is not the first one to do so but probably is the most direct and open about making the claim for a new architecture style that is radically different from anything been here before. However, Oosterhuis gives it another 50 years to be fully established and common practice world wide. Image taken from Modern Journal / Book Spread showing the Al Nasser Head Quarter Project by ONL. Leading architecture school all haven been for a number of years participating in this field of parametric design with dedicated units and courses to the topic. The AA, the Bartlett, TU Delft (Oosterhuis’ lab), or at Yale to have only a few examples. Digital computing in architecture, especially in schools is common practice and firms like Zaha Hadid and Frank Gerry are other companies heavily using and developing such technologies. Oosterhuis brings together in his book a well structured and comprehensive presentation of the changes brought along by the new technologies and methods and also outlines the process he has developed over the years as a ‘workflow’ or better probably a methodology. The presentation, as it starts in the introduction and spans right to he conclusion (which is actually already featuring in the introduction), is dominated by a very personal presentation of facts and points. This is on one hand irritating, probably because one would expect such proposal to take an objective position. On the other hand this provides space for a wealth of examples and experience presentations otherwise not possible. To some extend it also stands opposed to the process and the method being generally understood as objective, algorithmic, in the sense of digital evolution with little conventional design elements, and therefor rather absolut. The presented personal standpoint in this sense helps to brake this up and develop a rather subjective understanding of the method. There is a lot of presentation and a clear structured text with a wealth of practical examples supporting the case. The proposition of a change a paradigma shift in architecture, or parts of the architecture world, is on one hand overdue and on the other already superseded by itself. The field is moving very fast, but is still in development and this makes it extremely difficult to comprehensively bring the fundamentals and extend of a new kind to the point. Nevertheless, this book brings together a experience and development background of about 30 years in the field and at least bring this to the point. A very good start for a new kind of building. Image taken from Modern Journal / Book Cover. Oosterhuis, K., 2011. 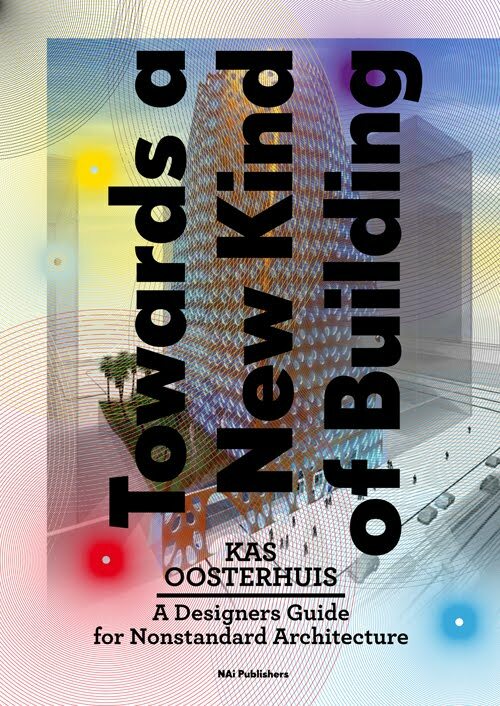 Towards a New Kind of Building: A Designerʼs Guide for Non-standard Architecture, Rotterdam: NAI Publishers.